On 01 April 1928, Jim Hemphill and Leo Morrison were joined in the holy bonds of matrimony. They were married in Murray County, Georgia. Jim was my grandfather’s eldest brother. From this record, I learned the date and place of Jim and Leo’s wedding. This also gave me a primary source for Leo’s surname and middle name (her full name was Mattie Leo Morrison). 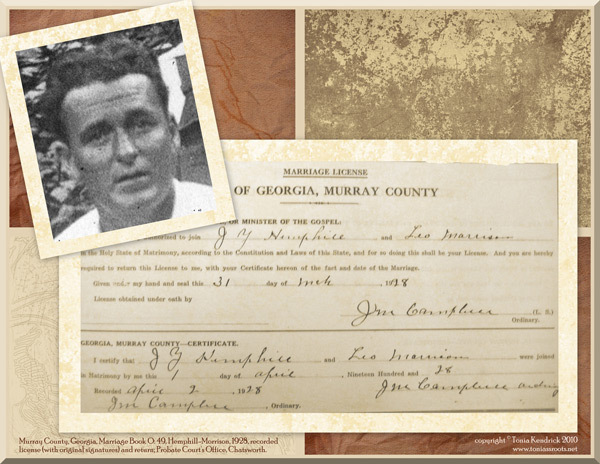 Source: Murray County, Georgia, Marriage Book O: 49, Hemphill-Morrison, 1928, recorded license (with original signatures) and return; Probate Court’s Office, Chatsworth. Leo and Jim were my grandparents (Thomas Eugene’s parents). Many, many fond memories growing up with them. Hi Deedra, I remember you from family reunions. John Edward was my grandfather.